The Running Y Ranch Resort. Located near Klamath Falls, Oregon on the largest inland body of water west of the Rockies. The Running Y is defined by abundant wildlife, breathtaking wilderness, and its distinguished status as Oregon's only Arnold Palmer Design Company-designed golf course, recently rated #1 by Golf Digest Magazine. Hike, horseback ride, and canoe 3,600 acres of emerald forest, endless sky, and placid waters. Witness the majesty of one of the greatest concentrations of migratory waterfowl and wintering Bald Eagles in North America along resort wetlands. Take in the vibrant history and rustic style that gives Running Y a heritage as rich as its lush surroundings. 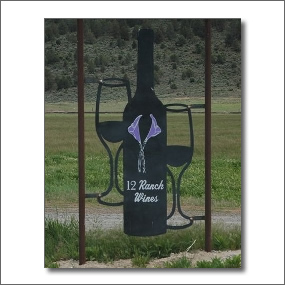 12 Ranch Wines is a small family owned winery located in Bonanza, Oregon. Ken and Connie Masten are the wine makers, they work closely with a selection of the best vineyards of southern Oregon to produce small lots of handcrafted Merlot, Cabernet Sauvignon, Syrah and Chardonnay. The wine is aged in Hungarian oak barrels which adds to the complexity of the finsished wine, and allows the unique flavors of the fruit to shine. The resulting wines are 100% unfiltered and handled using only the gentlest of gravity flow methods. Stop by for a visit, do some tasting and enjoy the beautiful landscapes of Bonanza, Oregon, just 20 miles east of Klamath Falls.